This is where to buy your Orange Peel Texture Sponge! For wall or ceiling repairs, I have perfected the art of matching orange peel texture with my orange peel texture sponge. Now you can match orange peel texture like a Pro! Because of the mess and amount of protection you need to spray a orange peel texture on a small drywall repairs or ceiling repairs. I recommend not using a compressor and texture hopper for these types of small drywall and texture repairs. A hopper simply is hard to dial in and get the right size splatters when trying to match knockdown texture. Texture hoppers also put out too much texture on not only the repair but the surrounding area when the texture is better if it’s concentrated to a smaller area around the repair area. Resulting in too much orange peel texture build up on the original orange peel texture that you’re trying to match. Never really making the patch invisible. Along with the Orange Peel Texture Sponge this texturing project will require a couple more hand tools to do be able to blend the Orange Peel texture. I’ve found in my over 20 years in business as a drywall contractor and painting contractor, that using my texturing technique along with my orange peel texture sponge. I could match or at least get really similar orange peel texture on the smaller wall and ceiling orange peel texture patch areas. After drywall repairs were primed and painted you couldn’t even see the repaired wall or ceiling areas. 1) Cover and protect flooring and any personal effects with lightweight plastic or a drop cloth. 2) Using your new orange peel texture match sponge, 6″ to 12″ taping knife and a drywall mud pan or hawk, you’re ready to apply the orange peel texture mix to the repaired area. *Tip- Use all purpose joint compound and thin it down with just a tiny bit of water to get any air pockets out. 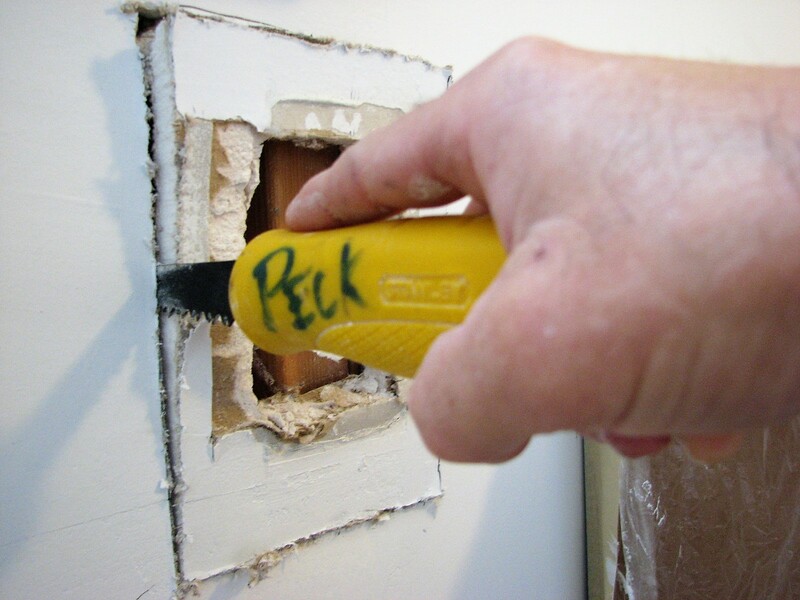 3) Once all of the ceiling or wall repair is covered with about 1/4″ of the orange peel texture mix. Dab and pull in a rapid motion to achieve the orange peel to match your old texture. Feather the texture out from the repair at least 12″ inches so that the new orange peel texture blends out gradually into the existing ceiling or wall orange peel texture. 4) Lastly, Let the ceiling repair and orange peel texture dry overnight before priming and painting the repair. *Tip- For priming and painting, I like to use a roller with a 1/2′ to 3/4″ inch roller nap. **Important: Orange peel textures vary! I recommend trying out your new orange peel texture sponge on a scrap piece of drywall or piece of cardboard to dial in your specific orange peel texture that you’re trying to match.